This book provides hands-on techniques for writing engineering procedures to achieve ISO 9000 compliance. It is designed for individuals responsible for writing these procedures in any industry. Readers will find actual examples of clearly written, compliant engineering procedures, ready to adapt to your own industry and your own particular needs and use immediately. It answers virtually all your procedure writing questions. Procedure writers will gain a general understanding of engineering documentation principles and how to apply them to their own situations. Simple diagrams and other graphics illustrate key ideas, giving a bird's-eye view of what is coming next. 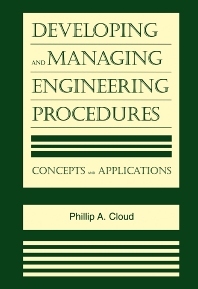 The intent of the book is to familiarize the reader with the essential elements and concepts of engineering procedure development and management and show how to apply these concepts to their own specific applications. The author emphasizes engineering principles and tools that are common to all engineering disciplines, with examples for their use. Step-by-step procedures shown for each document format enable readers to apply each format to their own engineering documentation programs quickly and easily. The book provides a fingertip reference that covers the entire engineering procedure process, using the latest technology for engineering documentation systems. Explicit writing instructions for individuals responsible for writing engineering procedures in any industry.